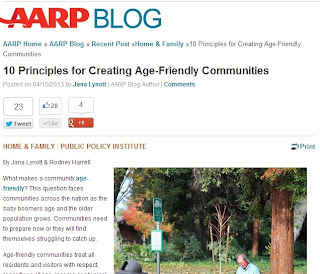 As I mentioned in my last post here on the DrUrbanPolicy blog, Jana Lynott and I recently kicked off the AARP Public Policy Institute blog with a list of our "10 Principles for Creating Age-Friendly Communities." In this post, we looked at AARP policy principles to begin to describe what's needed to make a community "Age Friendly." There will be more posts from the Institute as part of the AARP blog in the coming weeks and months, and I plan to link to those contributions from this blog. The content of this particular post was the focus of Jana's talk during a session with other aging experts at the 2013 National Conference of the American Planning Association. Check back later for my comprehensive look back at the conference.